2016 is the year of no excuses! I’ve heard so many people tell me that they’ve always wanted to start investing, but they didn’t know how to get started. I was in your exact shoes. Three years ago I decided to finally do something smart with my tax refund money. Was it three years ago or four years ago, it’s all starting to blur together. Anyway, I took $1,000 from my tax refund and opened up a brokerage account with Charles Swab to start investing. The next year after that I used part of my tax refund to open up a Roth IRA account. I admit I was afraid to start investing. I didn’t know how to choose a stock, or if I would lose all my money. Luckily I had an older cousin that was there to teach me the dos and don’ts of investing. He had been investing for years and was seeing pretty good results. Until then I didn’t know anyone in my circle that was investing. My cousin showed me how to choose what stocks to invest in and how to figure out if it’s a good company to invest in. He really made investing super easy to understand. All these years investing seemed way too complicated for me, but the way my cousin broke it down it was really simple. I took all the knowledge that he gave me plus did more research on my own and turned it into a book for you to understand investing. If you don’t start to save and invest your money, you won’t see any of the benefits now or in the future. Yes, those shoes look lovely on you my dear, but how does your bank account look? How do you plan to make your money grow this year? Next 5 years? Next 20 years? How much money each month are you putting aside to invest? These are the important questions you need to ask yourself. It’s time you put down the excuses, and start investing. You’ve always wanted to learn how to start investing, but just don’t know where to start. You’re ready to start taking control of your finances. You’re tired of making excuses, and not starting. You don’t understand the investing process. Which stocks to choose? How to decide which brokerage account to go with? You’ve tried to read other investing books, but they were boring and didn’t keep your attention. 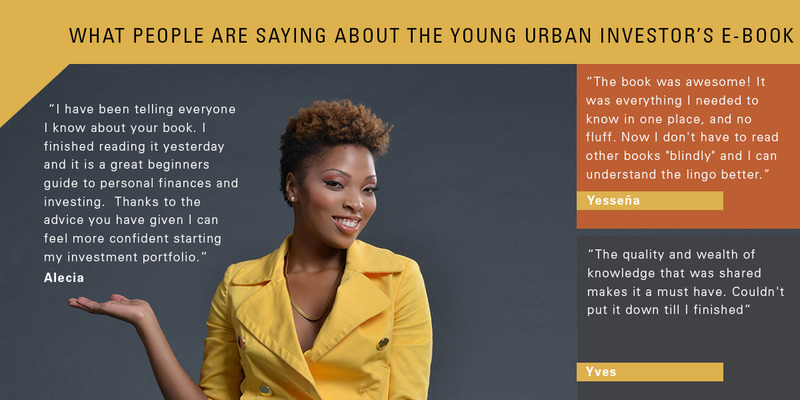 What the young urban investor’s e-book really offers? Included in this e-book: In this 10 chapter book I will walk you through how to start investing in the stock market. Chapter 1: Forget these shoes, I’ve got some shares to buy. Get the blueprint for the real luxuries in life. Hint it’s not found in your closet. Chapter 2: Top myths people tell themselves that stop them from investing. I bust 4 myths that you’ve probably been telling yourself all these years. Chapter 3: why the rich keep getting richer? This chapter is all about ownership and the beautiful benefits of investing. Chapter 4: Don’t let fear keep you from being great. Master the process of detaching fear. This chapter will help ease your fears on investing. Chapter 5: Top things to do before you start investing. Learn the key steps to take with your finances, before you start investing. Chapter 6: choosing a great stock to invest in is like choosing a great outfit. This one pretty much speaks for itself. Chapter 7: Rule no. 1 only buy great businesses? Understand what makes a business great. I’ll walk you though choosing your list of great companies to start investing in. Chapter 8: how to open a brokerage account? There are tons of brokerage accounts find out which one is the right one for you. Chapter 9: I have my brokerage account, now how do I start making money? I will walk you tough the process of buying your first share. Chapter 10: Congrats you’re an investor. 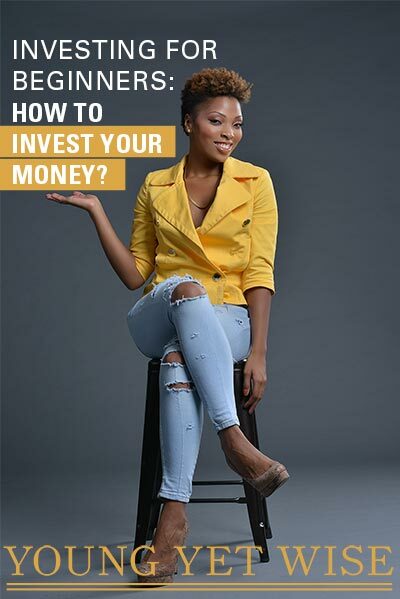 The Young Urban investor’s e-book has made it ridiculously easy to learn how to start investing. What do people really think? 1. Click the buy now button anywhere on this page. 2. Enter your email and credit card information in the secure checkout system. 3. You’ll be emailed a link for the pdf download. What will happen once I purchase the e-book? The e-book will be sent to the email address you’ve entered in a versatile pdf (works on computers, ipads, cell phones or can be printed on letter sized paper). You will read the book get over your fear of investing, figure out which companies you will invest in and open up a brokerage account to start building long term wealth. Not ready to start investing, but you still want to make progress in your finances? 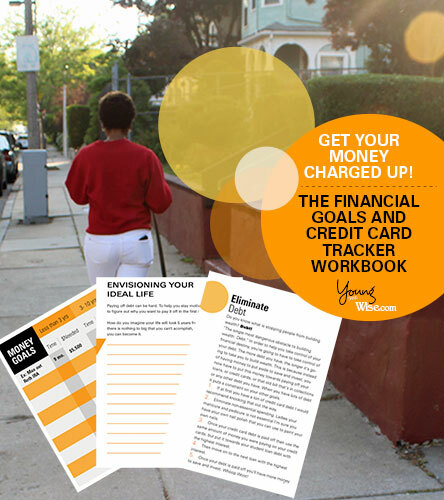 Download my free credit card tracker workbook. Download your free workbook here.